Did Tiffany Trump make a statement with her SOTU dress? 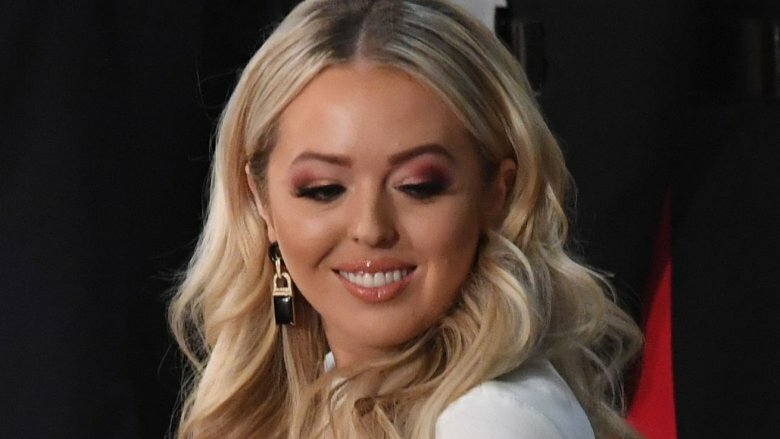 Tiffany Trump, the youngest daughter of President Donald Trump, arrived at her father's State of the Union address in an outfit that caused many people to immediately take notice. On the night of Monday, Feb. 4, 2019, Tiffany attended the SOTU, wearing a form-fitting white dress with a beige belt. And according to some, the 25-year-old's fashion choice just may have been a way for her to signal that she stands with Democratic women, as reported by the New York Post. You see, there was an unofficial dress code at the SOTU address for women to celebrate the 100th anniversary of the 19th Amendment, which allowed women to vote (via Cosmopolitan). As noted by The Washington Post, the suffragettes chose white, purple, and green as their movement's official colors. And the women in politics today reportedly chose to wear white in an effort to visually call attention to themselves. Author of Suffragists in Washington, D.C.: The 1913 Parade and the Fight for the Vote, Rebecca Boggs Roberts told The Washington Post, "It's a color that's going to stand out in a sea of navy suits, so that looks good on television," adding, "They're doing exactly the same thing." According to CNN, the House Democratic Women's Working Group was behind the decision for people to wear white at the SOTU address. While many women wore white to the event, white ribbons were handed out for others to partake in the collective statement without wearing head-to-toe ivory. Florida Democratic Rep. Lois Frankel, who serves as the chair of the Women's Working group, told CNN, "Wearing suffragette white is a respectful message of solidarity with women across the country, and a declaration that we will not go back on our hard-earned rights." Wearing the color was also a way of peacefully protesting President Trump's administration, as Frankel also explained to CNN, "We wear white to unite against any attempts by the Trump administration to roll back the incredible progress women have made in the last century, and we will continue to support the advancement of all women." 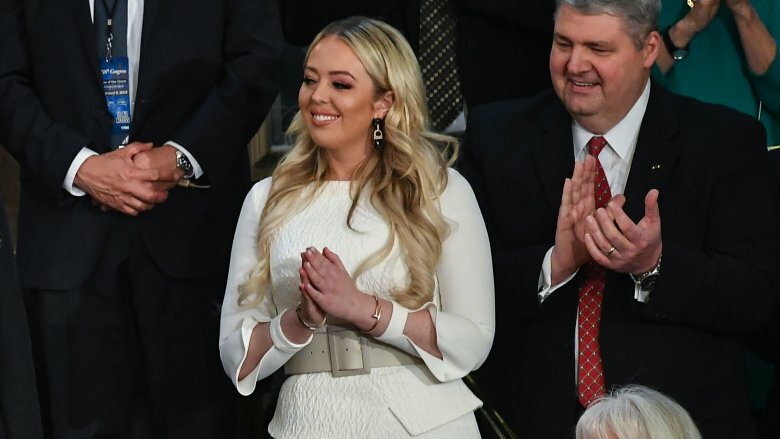 Everyone from House Speaker Nancy Pelosi to New York Rep. Alexandria Ocasio-Cortez wore white at the address, but Tiffany Trump was the only member of her family to wear the color to the event. Her sister, Ivanka Trump, instead wore a black jacket designed by Alexander McQueen with a black skirt, while her stepmother, Melania Trump, wore an all-black Burberry number, as reported by E! News. Oh, and Melania also wore one lone black glove that seriously confused Twitter users, but that's not really important (via AOL). So, it was certainly interesting for Tiffany Trump to wear the color given her family's conservative politics and, of course, her father's position as the commander in chief. Add to that the fact that Tiffany also sat away from her family at the SOTU address. Hmm… so what's the deal here? Well, many believed that Tiffany was trying to honor the suffragette movement and stand with women in politics, particularly those who oppose her father's views, as some took to social media to share. "Looks like Tiffany Trump is making a statement by wearing white tonight!" one Twitter user posted. "Welcome to the resistance," another quipped. Referencing a moment during the SOTU address when women cheered after Trump acknowledged that there were "more women serving in Congress than at any time before" (via The New York Times), one social media user tweeted, "I'm not sure what pissed Trump off more, his daughter wearing white or every Woman Democrat in the audience breaking out in a USA chant." Another tweet read, "Okay wait wait wait wait wait… IS THAT TIFFANY TRUMP WEARING WHITE like all the Democratic Members of Congress?!?!?! I mean, someone told her RIIIIIIIGHT?!?!?!?!?!?!#SOTU." As noted by HuffPost, however, it's possible that Tiffany simply likes wearing the color white. She previously wore white to her father's 2018 SOTU address and often dons the color while visiting the White House. So, Tiffany may have just worn that white dress to the 2019 SOTU address without even knowing about the House Democratic Women's Working Group's encouragement for people to wear suffragette white at the political event. At the time of this writing, Tiffany Trump has yet to address her wardrobe choice.